The Mimosa is a classic cocktail — it’s delicious, boozy, and because of the low alcohol content, you can sip all day. The grenadine and grapefruit create a perfect balance of sweet and citrus while the Champagne on top lengthens the cocktail and contributes a beautiful effervescent mouthfeel. At Peaks and Pints, we serve gose-mosas. You’ve heard of gose. It’s German, a sour beer. Pronounced “Go-zuh,” like the thing that wrecked New York in Ghostbusters. Reported to be between 200 and 1,000 years old, it’s sour and salty, a low-ABV session beer, which means it won’t get you sauced. It’s a wheat beer that balances a sour twang from lactic acid-producing bacteria, a distinct salinity and a subtle floral spice from added coriander. It’s made with a souring process using a natural bacteria like what you’d find in yogurt. This provides a natural acidity; a really nice tartness that helps balance. It has a really clean and dry finish with a bit of salt. 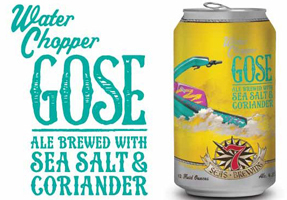 Our house gose-mosa is made with 7 Seas Brewing’ Water Chopper Gose and grapefruit juice. Today, we’re offering an all-day flight of five different goses mixed with grapefruit juice that we call Craft Beer Crosscut 1.13.19: A Flight of Gose-Mosas. 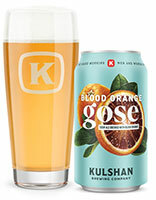 Brewed with malted wheat, Pilsner malt, German Perle hops, blood oranges, coriander and Himalayan pink salt, Kulshan Brewing’s Blood Orange Gose is a tart, refreshing wheat ale that is kettle-soured with lactobacillus. The liberal additions of blood oranges during fermentation imparts tangy citrus notes that complement the champagne-like flavors, creating a complex and sessionable ale. Using the base recipe of Anderson Valley Brewing’s 2014 The Kimmie, The Yink, and The Holy Gose, the Boonville, California brewery adds copious additions of blood orange puree during fermentation, imparting tangy citrus notes and a slight sweetness to complement the salinity and tartness in this refreshing session wheat beer. Unlike traditional versions made popular in Leipzig, Germany, Anderson Valley adds lactic acid to the kettle before boiling, followed by additions of sea salt and their proprietary yeast strain into the fermentation tank. This dry, moderately sour, and extremely refreshing beer is made in the gose tradition at 7 Seas’ Tacoma production plant. Water Chopper Gose is fermented with Lactobacillus in conjunction with 7 Seas house ale strain, and brewed with 35 percent malted white wheat and German Pilsner malt. For local flavor, 7 Seas Brewing adds San Juan Island sea salt, and a pinch of coriander. SeaQuench Ale is a session sour mash-up of a crisp Kolsch with lots of wheat and Munich malt, a salty gose with black limes, coriander and sea salt, and a citrusy-tart Berliner weiss made with lime juice and lime peel, blended together in the fermentation tank to create this German hybrid. Dogfish Head’s experimentation focuses on three thirst-quenching styles with German roots, but no single style quite hit the mark and mood the brewery was going for — so it blended them for a cloudy gold brew with a savory and citrusy smell. It has a fair amount of tart wheat and coriander character, but the salt and lime are extremely strong. There are many goses brewed in the same vein, but not many are this dry, bright and thirst quenching. Modern Times Beer’s Sula fruited sour gose is brewed with raspberries, blackberries, and black raspberries that leans more toward raspberry with plenty of tartness, some sweet sugary malt, a little salt, a dab of lemon zest and very drinkable.